Every decade has its pop stars, some of whom endure, some of whom vanish very quickly. In many ways the 1970s was a golden age of pop music, and many of the big songs from the time have become classics. Apart from international stars like Abba, it was a great time for British pop music, too. Glam dominated the first part of the 70s, but it wasn’t the only game in town, although Gary Glitter, the Sweet, Slade and T.Rex still sold singles by their hundreds of thousands and Elton John scored hit after hit. But others did surprisingly well. Mud had been around for a few years when they hooked up with Mickie Most, a producer who had a feel for hit songs. 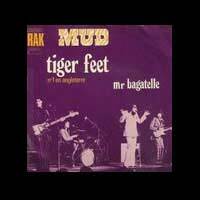 Between 1972 and 1974 they hit the charts four times, the last being the classic romp Tiger Feet, which stormed to number one. There was nothing deep about either the music or the performances – they were a good time rock’n’roll band, fine for parties and nothing more, and with no pretensions of art. The hits continued even after they signed for a new label, some of them covers of 1950s American rock songs (something that perfectly suited their carefree style), with singer Les Grey frequently sounding like Elvis Presley. Their records stayed popular until 1976, when the advent of punk changed everything, and they can still be found on 70s revival tours. Alvin Stardust emerged in 1973, a mysterious figure dressed in leather. But the person behind the name, Shane Fenton, was no newcomer; he’d made his first records before the Beatles were famous. That made him much older than many other pop stars around, but it didn’t stop the hits, starting with My Coo Ca Choo, which hit the number two spot, followed by Jealous Mind, which went all the way to the top. His image was the brooding, unsmiling pop star – a sort of pop Johnny Cash - although the glove he wore presaged Michael Jackson. He enjoyed five more hits before the end of 1975, one of the biggest-selling artists of the period, after which he returned to being an old-time rocker until 1980, when he signed with the independent Stiff Records, enjoying a couple of hits during the decade. Cat Stevens had been a young pop star in the 1960s, but was forced to take time off when he contracted tuberculosis. He re-emerged in 1970 as a sensitive singer-songwriter, but with his pop sensibilities intact. The hits, quieter and more reflective, kept on coming, like Morning Has Broken, Peace Train, Moon Shadow, Can’t Keep It In and many others, making him a much bigger star than he’d ever been before, one who managed to satisfy both the pop and the more “serious” markets, both at home and overseas. He continued releasing music until 1978, shortly after his conversion to Islam, after which he retired. He only re-emerged in late 2006 with the album Yusuf. Some pop stars just endured. Cliff Richard, for instance, was a regular chart fixture throughout the 70s, and even the Rolling Stones could still make the occasional hit single. Others came and went quickly, one hit wonders. For a short while even David Bowie was a major pop star, from the time of Ziggy Stardust to Diamond Dogs. The idea of pop music was still wide open, able to accommodate anything from the wild to the manufactured.